This small (1.5 acres) CRP field is in the far eastern end of the Conservancy and remained fallow until 2004, when it was treated with herbicide in advance of planting it to prairie. It was treated twice in 2004 and twice more in 2005, and was then virtually devoid of plants. 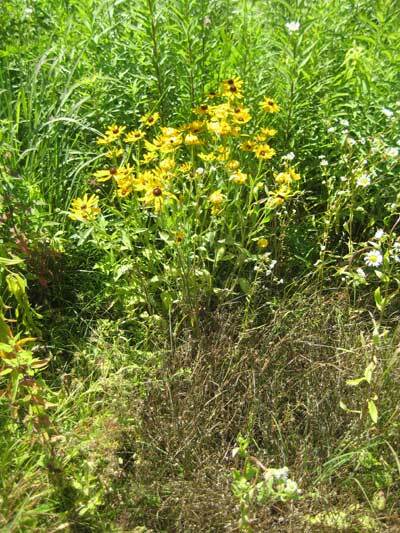 It was planted with a dry-mesic prairie mix on top of a light snow cover in December 2005. In the first growing season primarily annual weeds were present (Erigeron philadelphicum, Tancetum vulagare, Potentilla argentea, and Oxalis stricta), although there was a few patches of lupine (Lupinus perennis), evening primrose (Oenothera biennis), great blue lobelia (Lobelia siphilitica), and black-eyed susan (Rudbeckia hirta) in flower. 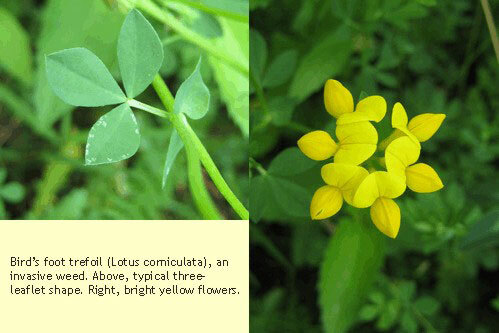 A large amount of bird’s foot trefoil (Lotus corniculata), an exotic agricultural crop plant, appeared in the middle part of the field. The origin of this infestation is unclear, but this same weed is found in our other former agricultural fields. Each trefoil plant was dug and removed. The whole prairie was mowed in early September to remove the annual weeds and to reduce the seed load of undesirable species. In the second growing season, more prairie species were seen, either in flower or in the vegetative state. These included Rudbeckia hirta, Baptisia alba, Lupine perennis, Penstemon digitalis, Erirgeron philadelphicus, Asclepias syriaca, Arnoglossum atriplicifolia (flowering), Cirsium discolor, Achillea milleflorum, Monarda fistulosum, Bromus kalmii (flowering), Gaura biennis (flowering), Rudbeckia triloba (flowering), Elymus virginiana (flowering), Solidago nemoralis (flowering), Aster pilosus (flowering), Aster laevis (flowering), Aster oblongifolius (flowering), and Aster nova-angliae (flowering). 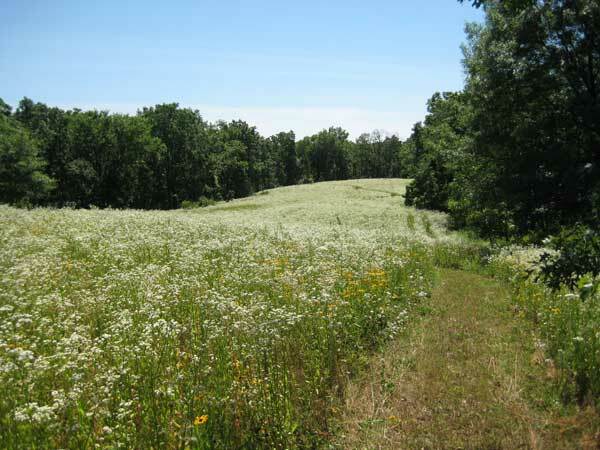 However, as the photo below shows, the main flowering plant during mid-summer was daisy fleabane (Erigeron strigosus). 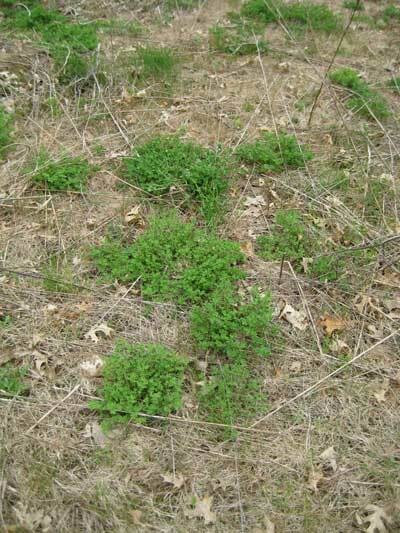 Since this annual weed is native and does not persist it was allowed to remain. In addition, there were many undesirable plants, including more bird’s foot trefoil (removed by digging), oxeye daisy, tall lettuce, timothy, orchard grass, and bladderwort (flowering). By early August of the second growing season there was a large amount of Queen Anne’s lace (Daucus carota) in flower in parts of the prairie. These areas were mowed to keep them from setting seed. A survey of the prairie showed a large species diversity of prairie plants, including lots of Indian grass (Sorghastrum nutans) and little blue stem (Schizachyrium scoparium). Despite the extensive control of bird’s foot trefoil in the first and second growing seasons, there was still a major infestation in the third growing season. 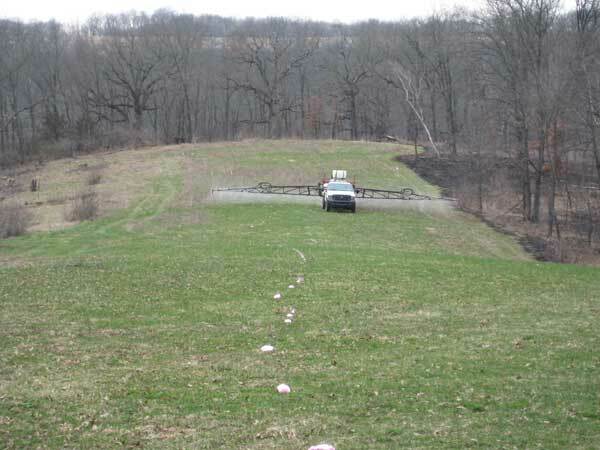 Because most of the plants were well separated from the “good” plants, herbicide was used to control the trefoil. The herbicide of choice was clopryalid (trade name Transline), which is active against all broadleaved species but is especially effective against legumes. It took one person a whole day to seek out and spray all the bird’s foot trefoil plants. The spraying was very effective, and greatly reduced the amount of this nasty plant. Patches of bird's foot trefoil in the Ridge Prairie. Because all of the cool-season grass had been killed by the earlier spraying, these patches were easy to spot. All were sprayed with clopyralid (Transline). By mid June the Ridge Prairie was starting to look quite good. A large number of prairie plants could be identified at the vegetative stage, including a lot of compass plant, white wild indigo, prairie dock, black-eyed susan, sky-blue aster, etc. etc. 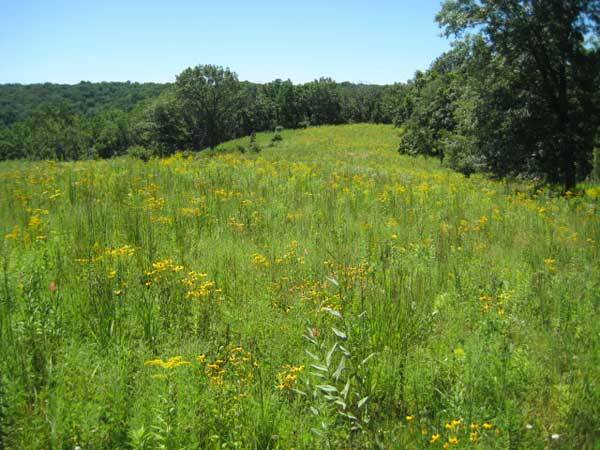 The photo below shows how the Ridge Prairie looked at this season. None of the green vegetation was from cool-season grasses. 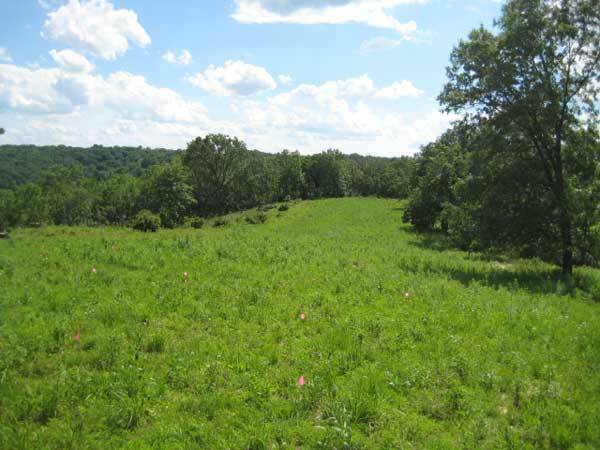 The photo below shows the Ridge Prairie as it appeared in early August 2008. 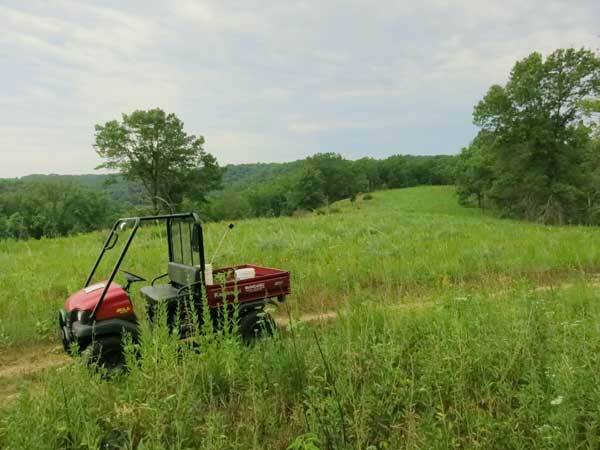 A plant survey recorded over 50 species of prairie plants, including those still in the vegetative stage, some in flower, and others past flowering and setting seed. The only invasive plant was scattered Queen Anne's lace, but this was removed a week later by the intern crew plus several volunteers. Once the main birds foot trefoil infestation had been eliminated with Transline, it was possible to use a simpler control method on the occasional plants that appeared in subsequent years. The technique is to grab some of the individual stems and lift them so that the center of the colony can be found. A few spritzes in the center is all that it takes to eliminate the whole plant. The photo above shows a dead birds foot plant adjacent to a thriving colony of black-eyed Susan. Although small, this prairie is attractive and interesting. It is adjacent to the East Basin, now mostly restored. These two prairies are now burned together (see photo below) and for most purposes have almost merged together. Ridge Prairie and East Basin just after the spring 2012 burn. The Ridge Prairie in July 2012. The large oak on the left is in the East Basin. Most visitors to Pleasant Valley Conservancy do not see this part of the preserve, since the main trail follows a different course. However, it is well worth a visit. The simplest approach is to walk up the gravel road from the parking area. Where the road forks at the top of the hill, take the right fork and you will come out at the location where this photo was taken. A mowed lane follows the east side of the Ridge Prairie, permitting a good overview of the whole unit.